Each week, TFD is taking an in-depth look at the cost of living in other countries, to learn how people like us are able to fund their worldwide dreams. Moving abroad is something many of us regard as an unattainable goal, but it shouldn’t be reserved solely for people who don’t have to worry about money. We have an incredible lineup of people who have moved to every corner of the globe, and are more than willing to explain what their expenses are, and what it took to take the plunge and move abroad. If you live abroad, or have lived abroad recently, and would like to participate in this exploration, email maya@thefinancialdiet.com. 1. What city did you live in, and when did you move there? Beirut, Lebanon. I moved there in January 2013. I now live back in the U.S.
2. What did you do for a living abroad? I was a freelance journalist and then the founding Editor-in-Chief of StepFeed, the homepage of the Middle East. 3. How exactly did you get that job, and how did you afford to move there? After studying Middle Eastern Studies at New York University, I always knew I wanted to live in the Middle East. However, upon graduation, I was offered an amazing opportunity as the Senior Manager of Corporate Communications for Forbes.com in New York City. I decided to work there for three years after college, saving money and learning about the media business. I’ve always been a writer, so when I saved up $15,000 in New York City, I decided to quit my job, move to Beirut and launch a freelance journalism career. I knew one person in Beirut and had never been a freelance journalist before, but thanks to former colleagues, a lot of coffee dates with war journalists and a little bit of luck, I was able to build a career for myself. One thing that I didn’t realize at the time that played to my favor was the amount of news coming out the Middle East, especially regarding the Syrian refugee crisis. Once I had a few clips under my belt, it was easy to pitch stories to media outlets. 4. What were your monthly expenses? That is difficult to say because when I first arrived, I was mostly living off my savings for the first six months, which meant I lived a frugal lifestyle. It was a while ago, but I think my rent, with everything included, was around $350/month. I know I aimed for my monthly expenses to be around $700. I also studied Arabic intensively for my first six months, which was around $800 per month. 5. What did you like about the culture of your city, and what has made it easy to acclimate? Beirut is a very welcoming city. 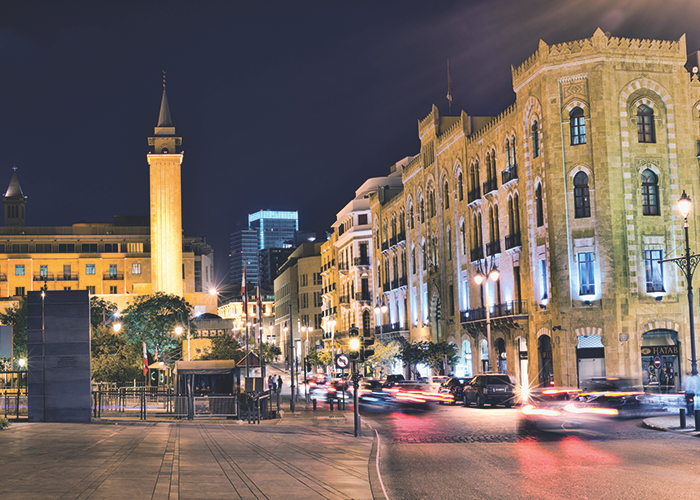 There are some challenges to living there, but in general, the Lebanese are very open to expats and love sharing their culture. Since most educated Lebanese speak English, French and Arabic, it is an easy city to get around. That being said, if you learn Arabic, as I did, it can go a long way when you are traveling outside of Beirut. 6. What was the biggest challenge your new culture presented? Did you experience “culture shock”? This is kind of a cliché, but I found it more difficult when I would visit home. When you are having a new experience, I think you are prepared for it to be different. That is what you signed up for. So even though there was limited public transportation and streets didn’t have proper names, it was expected. That being said, one thing I wasn’t prepared for was how seriously the Lebanese take their food. I would order breakfast foods like Labne or Fattet Hummus for lunch, only to be told by my coworkers how “cute” it was. Coming from the United States where there are so many different traditions, it was cool to experience a culture where there is a defined norm. 7. What obstacles did you face when moving abroad, and how did you deal with them? One of the most difficult things was explaining to everyone why I wanted to go. I’ve moved to the Dominican Republic as well and I have to say, the first move is the hardest. It can be exhausting to constantly justify why you are moving, especially if you aren’t moving to a “typical” destination. That being said, if you know you want to make the leap (and you have saved enough to afford it), just focus on that and let all the comments fall to the wayside. 8. What advice do you have for someone looking to move to your city? While Beirut might have a bad reputation in terms of security, I still felt comfortable and valued my time there. The city is an incredibly enthralling place. Historically, it has been a bit of a meeting point between the West and the East, which makes it an easy place for someone who isn’t used to traveling in the Middle East to get around. Also, the culture, food and nightlife are pretty outstanding. While it is known as a “party city,” there are so many better hidden gems that aren’t as well-known like all the wineries, Roman ruins, and old souks dotting the country. While it might not be the most easy-to-navigate tourist destination, it has a lot to offer to anyone who is willing to navigate bus routes and get very lost. 9. What was the process like for acquiring a visa before moving? Americans don’t need to apply for visas prior to moving to Lebanon. They can enter the country on a two-month tourist visa. 10. Are there certain expenses in your country that surprised you? Lebanon is very cosmopolitan but, at the same time, lacks a lot of basic services due to high levels of corruption in the government. Internet, electricity and water are all expenses that one doesn’t consider in the United States, but were definitely a factor in Lebanon. In the city, power cuts for three hours a day which means that most people have to pay for a generator. When I first started freelancing, I was okay with that but by the time my career progressed, not having internet or electricity for at least three hours a day wore on me, so I was forking over $100 a month, on top of the regular electricity expenses. Alexandra is a journalist currently living in Southampton, NY. She is a columnist and contributor at Forbes, The Southampton Press and Edible, among other places. She is on Twitter.